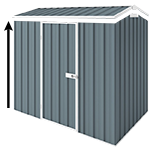 This 3m x 2.26m x 2m single door colorbond shed is very popular as it suits most Aussie backyards and has a very attractive price tag. You can choose from 4 different colors - Classic Cream, Pale Eucalypt, Paperbark, and Woodland Grey. Advantages - Looks good when set up, seems sturdy for its price, packaged well for easy transportation, shed pieces were well numbered, prompt delivery to depot. - Colorbond looks good, but scratches VERY EASILY (particularly during assembly). To make it clear, happy with the website, delivery, packaging etc. But the product itself is a disappointment. The shed was a great price and the perfect size for me. Few very minor issues but nothing drilling a few holes didn't fix with ease. I have to admit the customer service is the best I've had anywhere!!! The wrong colour got sent but it was fixed quickly and easily without any issues. I also had a part replaced without question. Highly recommend cheap sheds to anyone and have already signed friends up.